Photo from VT Fish & Wildlife. Darren Ouelette of Shoreham, Vt. with the new state record 44-lb. 6 oz. carp he caught recently in Lake Champlain. 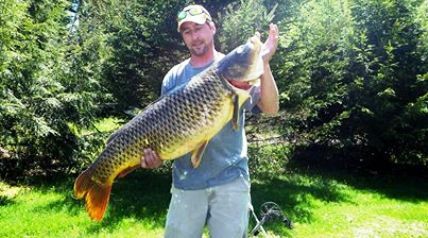 A Shoreham, VT angler took a new state record carp on May 20 from the Vermont waters of Lake Champlain. Darren Ouelette was bow-fishing for carp with Taylor Patterson in a backwater area of southern Lake Champlain when Darren spotted a very large carp cruising just below the surface in some flooded trees. Drawing quickly and taking aim, Darren arrowed the 44-pound 6-ounce giant, and then fought for over 20 minutes to land it on his fishing-modified compound bow. "I knew it was a pretty big fish when I first saw it, but I didn't think it was as big as it turned out to be," said Ouellette. "When Darren finally got it in close, I tried to net it but I could only fit its head in the net," added Taylor. "I ended up just grabbing it in the mouth by hand and swinging it in. I was shocked at how heavy it was when I went to lift it." Darren's fish eclipses the previous state record carp by nearly two pounds. That fish was taken by bow-angler Jeremy Ballantine in May 2013 on the Connecticut River and weighed 42-pounds 8-ounces. Although common carp have been naturalized in many waters throughout the country since the early 1800's, fishing for them gained little attention from North American anglers until recently. Carp-specific fishing magazines, clubs, television shows and internet forums are starting to pop up throughout the U.S. and Canada as anglers slowly realize the sporting opportunities and trophy-class potential common carp provide. "Common carp are actually smart, wary fish that spook easily," says Shawn Good, Vermont Fish & Wildlife's fisheries biologist who administers the Vermont Record Fish Program. "While it's still uncommon in Vermont, there is a small group of dedicated anglers I know here who target carp with fly fishing gear. These anglers tell me that carp are often referred to as "freshwater bonefish" because of the challenge and difficulty in taking one on a fly." And according to Good, Lake Champlain is ripe to provide those challenges to keen anglers who learn about productive carp fishing techniques. "Full grown adult carp in Lake Champlain average well over 20 pounds in size, with a real opportunity to catch them in the 30-pound range and higher," says Good. "In other places around the country where carp fishing has taken off, the most common method of fishing for them involves chumming an area close to shore with dough-balls or "boilies" to bring the fish in close, and still-fishing in the middle of your chummed area." Carp are incredibly strong and powerful fish, and when hooked, can make long, powerful runs. "Who wouldn't want to hook a 20-pound fish that fights like that! You may never fish for trout or bass again," teased Good. Good also points out that the "common carp," which has long been established in North American waters, including Lake Champlain since 1883, is a different species than the invasive Asian carp that has recently been in the news. He says non-native common carp do not pose the same threats to aquatic ecosystems and human safety that Asian carp do. Asian carp are not present in Vermont waters. The Vermont Fish & Wildlife Department has maintained the record fish program since 1969 to help monitor productivity of fisheries throughout the state and also to give anglers recognition for their exceptional catches. Ouellette's carp now stands as the single heaviest fish ever entered into the program, of any species, in the 45 years of the program's existence. You can learn more about Vermont's big fish records on Vermont Fish & Wildlife's website (www.vtfishandwildlife.com). A database of Vermont record fish entries is searchable by species, body of water and year of catch. While you are there, be sure to check out the Master Angler Program entries and photos.